This tutorial will guide you on how you can install The SHOUTcast Server in Ubuntu 18.04 LTS Server. Shoutcast is now installed and configured, it’s time to start Shoutcast service and access its web interface. To start the server execute sc_serv file from your current working directory, which must be the server directory, put it on background with & bash operator and direct your browser to http://ServerIP:8000 URL. Also use netstat command to see if the server is running and on what port numbers it listens. [email protected]:~/shoutcast$ 2018-12-02 16:46:55   WARN    [CONFIG] Ignoring streampath_1=http://ServerIP:8000 as this will produce an invalid path. That is all. 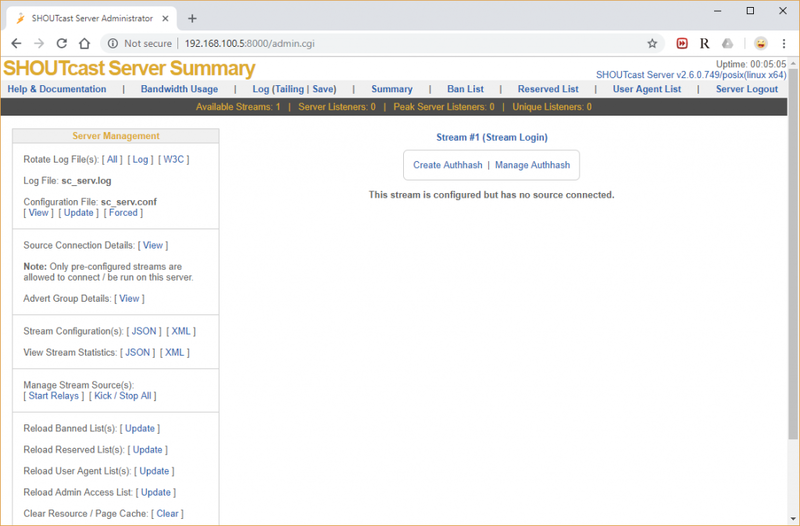 You have successfully installed Shoutcast server in Ubuntu 18.04 LTS server.